So Aimee used the word 'yummo' which kindof cracked me up. So now I am going to use it all the time. At The Cliff House by Ocean Beach. Took the 38L bus here and no kidding someone on the bus went to the bathroom in their pants. Gotta love public transit. 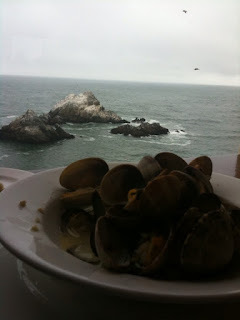 Anyway back to Ocean Beach...eating clams and drinking red wine and a piña colada. Dinner at North Beach tonight. Yummo.